Webpage created: February 06 2016. 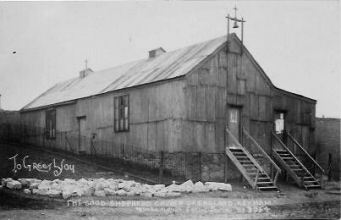 The Anglican Church of Saint Thomas the Apostle was situated in Renown Street, Keyham, Devonport. It was one of the churches built under the auspices of Bishop Robertson and the Three Towns Church Extension Scheme. The original Church was demolished in 2004 and replaced with a smaller one next to the former Vicarage in Royal Navy Avenue. From a postcard dated February 1907. On a site within a few yards of the iron Church of the Good Shepherd in which the people of north Keyham had been worshipping for 11 years, Lady Saint Levan laid the foundation stone of the Church of Saint Thomas the Apostle on Saturday April 27th 1907. The site was given by the Lord of the Manor and measured some 142 feet by 60. The building was designed by Messrs Hine, Odgers and May, architects, and the building of limestone with Portland and Bath stone facings, was to be of the Perpendicular style. It would consist of a nave, north and south aisles, with a tower at the south-west corner. The nave, aisles and the porch were to be constructed first at a cost of £3,445. It would provide seating for 520 worshippers. The old iron chapel was purchased second-hand by the vicar of the then parish church of Saint Mark in an attempt to cater for the 300 or so inhabitants of the parish who lived in the north Keyham district. It was erected on May 1st 1896. It appears to have been moved around as development took place in the area as it is said that Lord Saint Levan provided three sites for the building. Purses were then placed on the newly-laid stone by children, several so small that they were lifted up by the Bishop. The children were Alfred Warren, Charles Rendle, Sydney Hambley, Hubert Robins, Archie Warren, Leo Pfeiffer, Ernest Williams, George Hobbs, A Lang, Percy Noble, Gladys Booley, Louie Peel, Armetia Burnett, Olive Palk, Annie Saunders, Blanche Denley, Gwen Matthews, and Elsie Slater. St Thomas's was opened in 1908. The parish was formed on Sunday July 14th 1929 from that of Saint Mark, Ford. As confirmation of the creation of the new parish, the Church was then consecrated by the Lord Bishop of Exeter. The service was rather hurriedly arranged and the normal practice of holding Holy Communion was abandoned. The vicar was the Reverend W Gabriel Harris and the organist was Mr Burch. The Church Wardens were Messrs C T Nicholls and W Percy Aggett. In due course a nice new vicarage was erected in Royal Navy Avenue and this was Blessed by the Lord Bishop of Exeter on Saturday March 7th 1936. The first occupant was the Reverend D R Blackman, who had been Vicar of Saint Thomas's since October 1929.